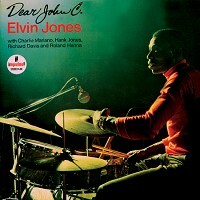 Drummer Elvin Jones may have been breaking down new rhythmic boundaries at the time with John Coltrane's Quartet but his own sessions as a leader were not all that innovative. This quartet set with altoist Charlie Mariano, bassist Richard Davis and either Roland Hanna or Hank Jones on piano is an example of how the avant-garde of the era was starting to influence the more mainstream players. The music is in general safe but enjoyable with the virtuosic bassist Richard Davis often taking solo honors on what was in reality a modern bop date.